July 2019 at The Summit in West Virginia. Only 6 spots left in our World Jamboree contingent Troops. Troop #2 – 6 slots left. Ellie Morrison, Troop 308, Waco, Texas, BSA’s new National Commissioner! Scouts from the U.S. can camp with thousands of Scouts from around the world without the cost of international travel. Transportation to and from WSJ is included. Click here for the awesome new WSJ video page! Girls who are not yet in Scouting but plan to join in 2019, and want to go to Jamboree, may sign up for World Scout Jamboree now. Contact Lonnah Curry to register: Lonnah.Curry@scouting.org. Be sure to register by end of summer! The World Scout Jamboree is an experience of a lifetime! Any slots remaining this fall will go to Scouts from other countries! Youth must be age 14 – 17 during the jamboree to attend – born between July 22, 2001 and July 21, 2005. Adults 18 and older may serve as Troop leaders or as Jamboree Staff (IST – International Service Teams). The 24th World Scout Jamboree (WSJ) is the largest event organized by the World Organization of the Scout Movement (WOSM), with up to 40,000 Scouts from more than 150 countries around the World. NOTE: A few 2017 National Jamboree Patch sets are still available. Click to buy 2017 National Jamboree Patch sets. Make new friends and learn what Scouting and life is like in other countries! The focus is on meeting people from different countries and doing jamboree activities and high adventure programs like zip-lines, kayaking, mountain biking, rafting, shooting, and much more! 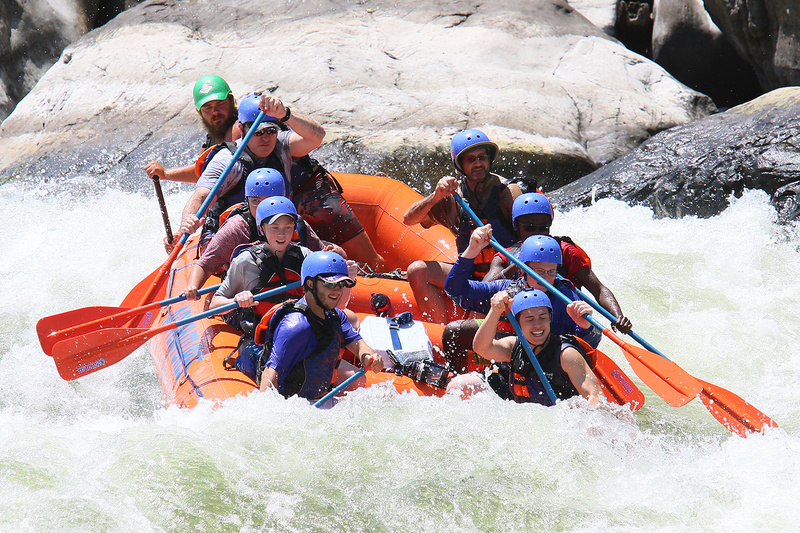 Greg Thomas and Gary Goldstein with Longhorn Council Scouts rafting Lower Keeney Rapid on the New River Gorge during their 2017 National Jamboree trip. Who can attend the World Scout Jamboree? Participants must be between the age of 14 and 18 (born between July 22, 2001 and July 21, 2005 (no exceptions). Adults over the age of 18 can serve on the International Service Team (IST) and as unit leaders. All participants, unit leaders and IST must be members of the Boy Scouts of America. The WSJ Contingent is open to all Scouts and Venturers who meet the age requirement. Girls who are not yet in Scouting but plan to join in 2019, and want to go to Jamboree, may sign up for World Scout Jamboree now as well. Participants must meet the physical requirements for attending the Summit Bechtel Reserve, found on the Summit Health Form. The Longhorn Council is sending youth and adults participants in two WSJ Scout Troops (each with 36 Scouts and 4 leaders) and one Venture Crew (with 36 Venturers and 4 leaders). Girls can attend. Selection of adult leaders for the WSJ Troops and Crew will be done by BSA’s Southern Region WSJ Team. All Adults who register, pay their deposit, and are approved by their council will be added to the adult Waiting list and queued for selection. In selecting leaders the Southern Region WSJ Team will give priority consideration to Scouters who have recruited a patrol or group of youth to attend WSJ, and who have their Council’s and their district’s approval and unqualified recommendation. Scouters who are local direct contact unit leaders will also get a priority consideration for unit leader positions. Leaders who are not selected for Troop leadership positions will be encouraged to apply for a Staff position on the International Service Teams (IST). $2500 for Participants and Leaders. The IST fee includes registration for the Jamboree, meals at the Jamboree, tents, and patrol and cooking gear, but does not include transportation to and from the Jamboree.The World Jamboree Organizers (Host) will provide transportation to and from a limited number of Gateways to the jamboree site. Those Gateway locations are identified as Yeager Airport in Charleston, WV, Charlotte/Douglas International Airport in Charlotte, NC, the AMTRAK station in Prince, WV, and the Ruby Welcome Center in Mt. Hope, WV. WSJ Chairman Tom Lucas: WorldJamboree2019@longhorn.org. Lonnah Curry: Lonnah.Curry@scouting.org – Girls who are not yet in Scouting but plan to join in 2019, and want to go to Jamboree, may sign up for World Scout Jamboree now through Lonnah.